DESSERTS RECIPES GOES IN HERE !!!!! In a bowl, combine cracker crumbs and sugar; stir in butter. Set aside 2 cups for topping. Press remaining crumb mixture into two greased 15-in. x 10-in. x 1-in. pans. Cover and freeze for at least 10 minutes. In a large bowl, combine ice cream and orange juice concentrate until smooth. Spoon over crusts (pans will be full). Freeze for 10 minutes or until partially firm. Sprinkle with reserved crumb mixture; gently press down. Cover and freeze for up to 2 hours. Remove from the freezer 15 minutes before serving. Yield: 2 desserts (24 servings each). 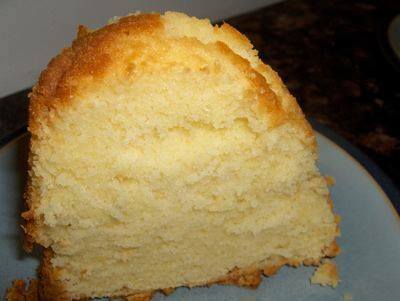 Bake a white cake, cool and poke holes in it. 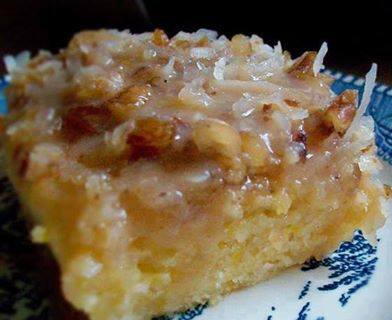 Boil crushed pineapple with juice and 1cup of sugar then pour over cool cake. In large bowl mix cream cheese, butter, powdered sugar. Add vanilla and crushed pecans, mix good and put on cake. 1.Combine the root beer, milk and pudding mix in a large bowl. 2.Mix with a whisk until it begins to thicken. Fold in half of the whipped topping and desired amount of root beer extract. Start with just a little of the extract and give it a taste. You can continue adding more until desired flavor is reached. Spread into the pie crust. Refrigerate for 5 minutes. Top with remaining whipped topping. 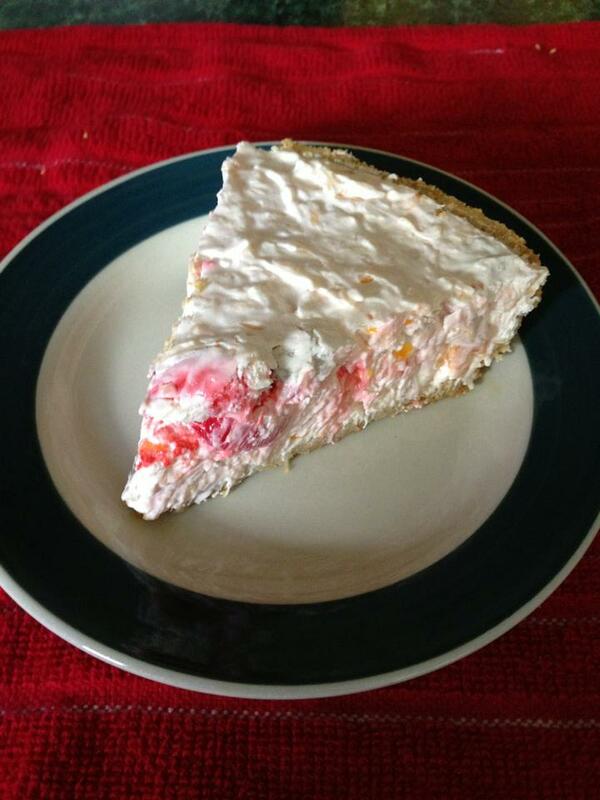 3.Slice the pie into 8 even slices (this makes it really easy to cut when it's frozen). Add a cherry on each slice. 4.Freeze 8 hours or overnight. Mix first 5 ingredients & pour into 9 x 12 glass baking dish. Pour this over & across the brownie mix. Take a knife & swirl through mix making a marbled design. Bake for 40 to 45 minutes or until toothpick in center comes out clean. Cool completely. Preheat the oven to 350 degrees. Butter a 9 inch spring form pan set aside. Whisk together the flour, sugar, cocoa powder, baking powder and salt in a bowl. Beat together the butter, eggs and vanilla. Add to the dry ingredients and mix until smooth. Stir in the toasted nuts. Pour into the prepared pan. I make this a lot an have for years. Everyone LOVES it!! Preheat oven to 350 degrees F. Unroll crescent dough and arrange 12 of the triangles in a circle with wide ends toward the outside edge of the Large Round Stone - the points will not meet in the center. Lightly flour and roll out the seams making a 14" circle with a 3" hole in the center. 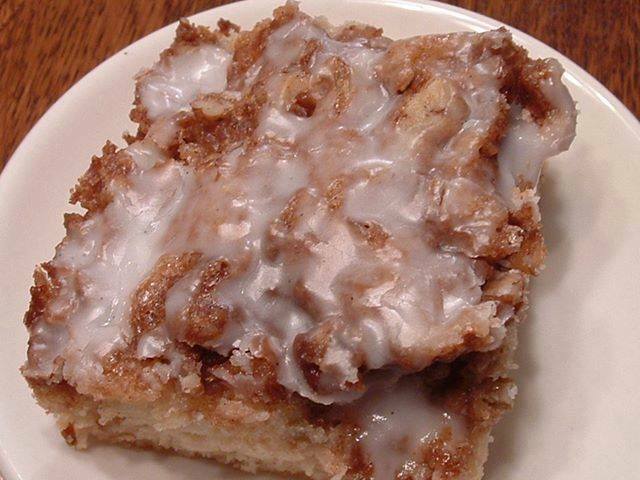 Combine the cream cheese, powdered sugar, egg & vanilla and spread over dough. 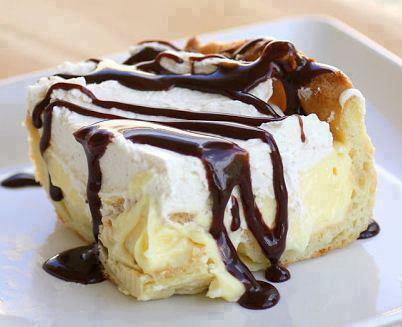 Top with pie filling. Cut each of the 4 remaining triangles into thirds (starting at the wide end opposite the point and cutting lengthwise to the point). Arrange over filling evenly in spoke-like pattern. Press ends to seal at center and outer edges. Bake 25-30 minutes or until golden brown. Cool slightly. 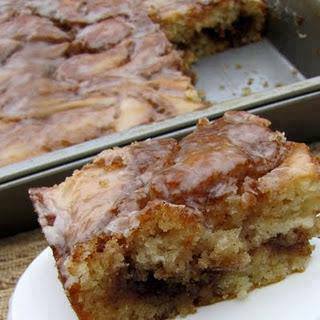 Mix powdered sugar and milk until glaze consistency and drizzle over coffee cake. Mix flour, salt, and sugar; add milk slowly. Stir constantly over low heat until thickened. Stir and cook for about 15 minutes. Beat egg yolks in bowl and stir into mixture slowly stirring constantly. Cook about 5 more minutes stirring constantly. Remove from heat and add vanilla. 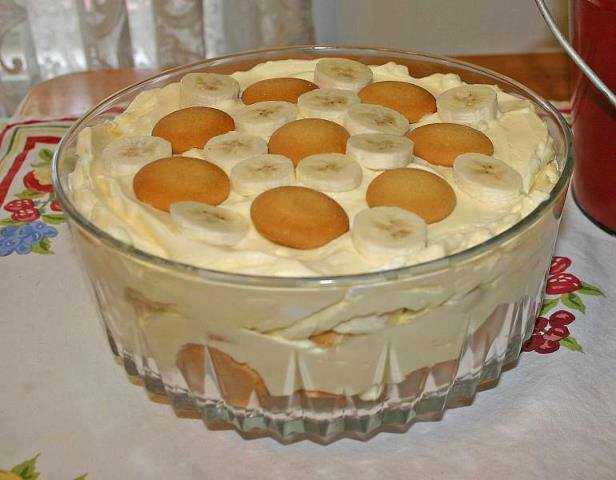 Line bottom of casserole dish with vanilla wafers, bananas (sliced) and custard mixture. 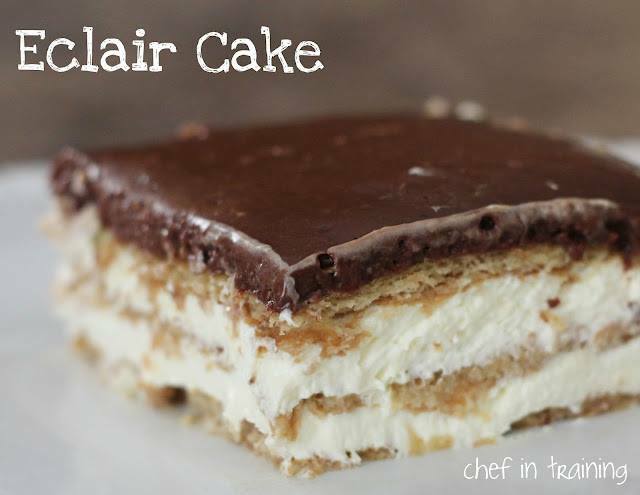 Repeat layers, ending with custard on top. Beat egg whites until stiff. Add 1/4 cup sugar; whip until it peaks. Spread on top of custard and bake in oven at 450 degrees for about 5 minutes or until browned. Remove from oven and serve. Line a 9x9 casserole dish with foil. Lightly spray it with cooking spray. In a large sauce pan add your white chocolate chips & sweetened condensed milk and heat over medium low heat until all of the chocolate has melted. 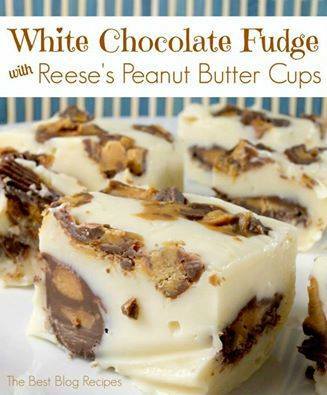 Once everything is well combined immediately pour the chocolate/milk mixture over your peanut butter cups. Chop the remaining 6 peanut butter cups into smaller pieces and spread evenly over the top of the mixture and press down slightly. Let cool on the counter for a while and then cover with plastic and put in the fridge to cool completely. We've actually just stored our fudge in the fridge to keep it longer since it made so much! Peach Cake is pushing 80,000 shares ! NO EGGS! 1 large can sliced peaches, drained and mashed (I used 2 regular cans since that is all I had at the time) You could also use fresh peaches. Drain the peaches and empty into a large bowl. I just used my hands to mash them. Add flour, sugar and soda and mix well. 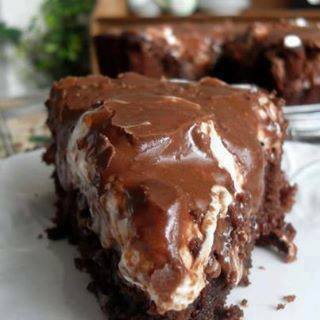 Spray a 9 x 13 inch cake pan and pour in batter. Bake in a preheated 350F degree oven for 35 minutes. See recipe below for icing. Preheat oven to 350°F. Place cupcake liners in muffin pans. Crush gingersnap cookies into crumbs (using a food processor or a rolling pin) until you have 1 1/2 cups. Combine gingersnap crumbs, butter and salt and mix with a fork until combined. By rounded teaspoons spoon the gingersnap mixture into the cupcake liners. Use the bottom of a glass to flatten and pack the crumbs. Bake gingersnap crusts for 5-7 minutes until golden. Let cool. Prepare cake batter as directed on package. 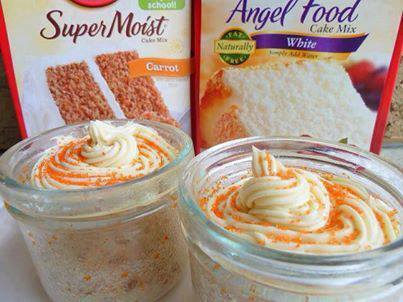 Pour batter into cupcake liners, on top of crust, filling the liners no more than 2/3 full. Bake for 18 to 22 minutes or until toothpick inserted into cupcakes comes out clean. Let cupcakes cool for 5 minutes, then turn out of pans to finish cooling. Cut a cone-shaped piece from middle of cupcake. Do not cut through gingersnap layer. Put cheesecake filling in a piping bag or plastic bag with the corner cut off and squeeze filling into hollow of cupcake. Pour 1 packet of Duncan Hines® Frosting Creations™ Gingerbread Flavor Mix into 1 can of Duncan Hines® Frosting Creations™ Frosting Starter. Stir until evenly blended. Repeat with second can and packet. Boil everything but the nuts on top of the stove until thickens, remove from heat, stir in nuts and spread on cooled cake. Line a square Corning Ware bowl with waxed paper, set aside. Melt candy corn in a med sized bowl in the microwave for 1 minute, stir and continue for another 30 seconds or until totally melted - stir. Add peanut butter(s) and stir. Microwave again for 10 – 20 seconds til easy to mix with a spoon; mixture will be thick. Smooth out into the prepared bowl and place in the refrigerator until cooled thoroughly. Remove from bowl, cut into 1” x 1” squares and melt chocolate. 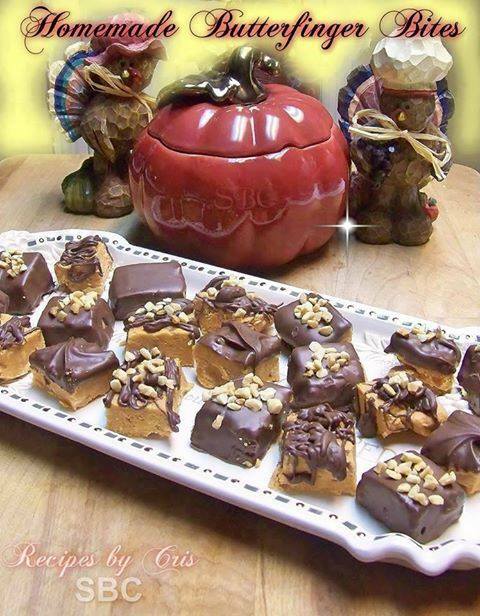 Either dip, dunk or drizzle the chocolate with each piece of candy. 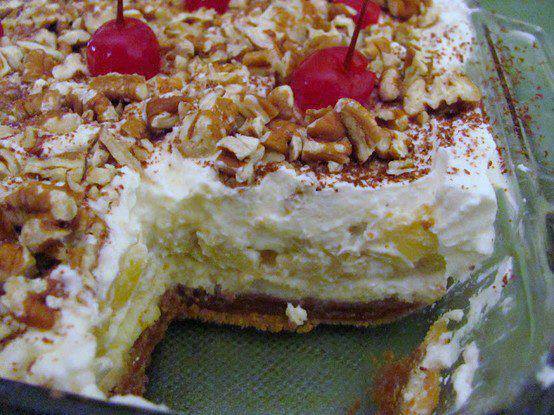 Top with chopped peanuts – if desired - and allow chocolate to harden. 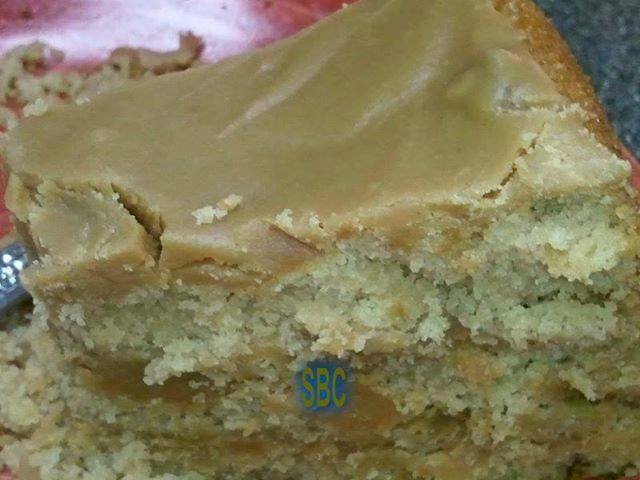 mix sugar and flour in a mixing bowl, add milk, peanut butter, oil and vanilla. Beat well. pour in 3 greased and floured cake pans. bake at 350 for 45 mins or until layers test done. Combine the peanut butter, margarine, milk and con sugar in a saucepan. In a large mixing bowl, cream butter and sugar together until fluffy. Incorporate eggs and beat well. Mix in sour cream, flour and vanilla and continue to mix well. 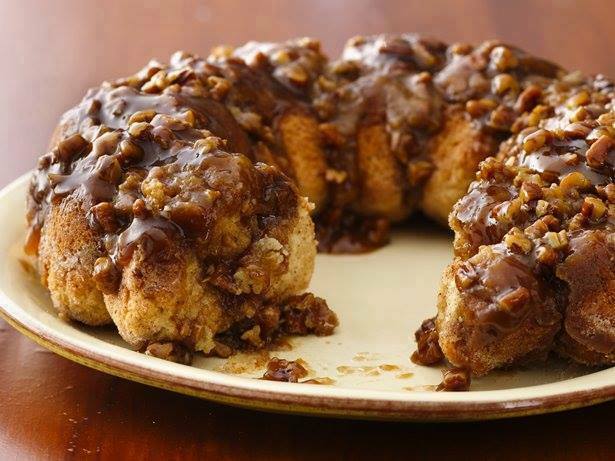 Pour into a greased bundt pan bake. In a medium mixing bowl, cream together cream cheese, milk and vanilla and mix until smooth. Slowly add confectioners sugar and beat until smooth. Drizzle over cooled cake. 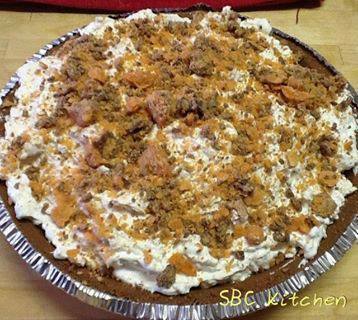 Combine softened cream cheese, cool whip and 6 crushed Butterfingers. Spoon into prepared graham cracker crust. Top with remaining crushed Butterfinger. Chill at least 4 hours. 1Heat oven to 350°F. Spray 12-cup fluted tube cake pan with cooking spray. 2In 2-quart saucepan, melt 3/4 cup butter. Add brown sugar and cream; heat to boiling over medium heat, stirring constantly. Boil 2 minutes; remove from heat. Pour into pan; sprinkle with pecans. 3In large bowl, stir Bisquick mix, milk, granulated sugar, 3 tablespoons butter, the vanilla and egg until soft dough forms. Shape dough into 1-inch balls. 4In small bowl, mix granulated sugar and cinnamon. Roll each ball in sugar mixture; place randomly in pan. Sprinkle with any remaining sugar mixture. 5Bake 22 to 28 minutes or until golden brown. Cool in pan 10 minutes. Place heatproof serving plate upside down over pan; turn plate and pan over. Remove pan. Serve warm. 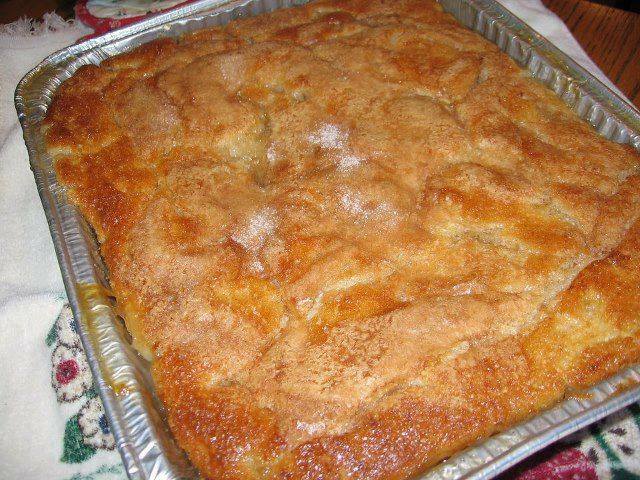 ~Old Fashioned Peach Cobbler~. Preheat oven to 400 degrees. (1) Melt 1/2 stick butter in 13x9 metal baking pan. Bring to a boil. (3) in small bowl, combine 3/4 cup water & 1 heaping tablespoon cornstarch and add to peach mixture. 2 teaspoons vanilla and enough milk to make a thin batter. (a little thinner than a pancake batter). (5) Pour hot peaches into pan with melted butter, and pour batter all over peach mixture. Top with cinnamon/sugar mixture, (1/2 cup sugar, 1/2 tsp cinnamon) and bake for 30 mi it's or until golden brown. Pour on pre-prepared pudding mixture over crust. Beat cream cheese, powdered sugar together until fluffy, spread on . Top with Dream Whip topping. 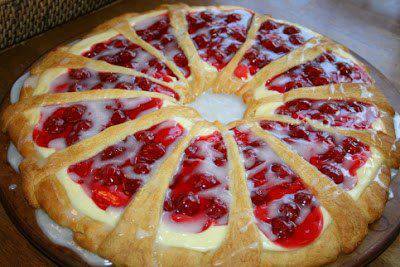 Cover entire pie or garnish with strawberries, cherries, pecans, and or other fresh fruit and nuts. Place sugar, butter and milk in a large mixing bowl. Cook in the microwave 2 minutes on high. Take out, beat ingredients with hand mixer until combined. 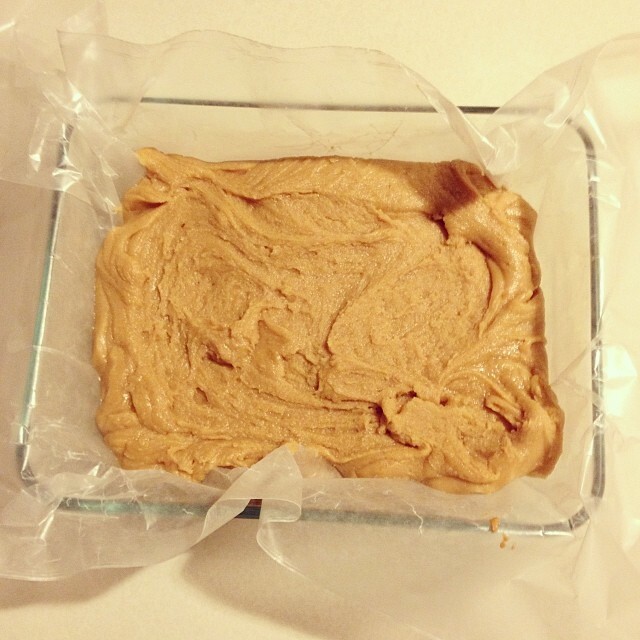 Microwave 30 seconds more, then add peanut butter and mix by hand or mixer until combined. Spread in foil or wax paper lined pan. Let cool then cut and ENJOY! Blend milk and vanilla pudding packets for about 2 minutes. Fold in Cool Whip. In a 9x13 pan, Layer graham crackers to cover entire bottom of pan. You may need to cut and shape the crackers to fit nicely. Put the final layer of graham crackers on top with bumpy side down. This will help the top look more smooth when you go to put the frosting on top. Once again, cut and shape crackers accordingly to avoid pits and cracks. SPRINKLE gelatine over cold water in saucepan; let stand 5 min. to soften. Cook on low heat until gelatine is dissolved. Beat cream cheese, sugar and juices in medium bowl with mixer until blended. Add mashed berries; mix well. Gradually whisk in gelatine. Refrigerate 5 min. or until slightly thickened. Whisk in 1 cup COOL WHIP; pour into prepared pan. REFRIGERATE 3 hours or until firm. Remove rim of pan; discard parchment paper. Cut reserved strawberries in half. Garnish cheesecake with halved berries and remaining COOL WHIP.